When we proof data, we make sure the front and back sides of the data are printed so that the top of both pages share the same edge. This is called ‘top to top’ orientation. If you are designing for a two sided, flat product, the orientation of your artwork will determine how the front and back sides will be printed in relation to each other. If both front and back pages have the same orientation (portrait or landscape) they will be printed top to top and bottom to bottom. If your artwork combines a portrait with landscape orientation file, one of the files must be rotated to match the orientation of the other file. Our standard rule is to rotate the back side file 90 degrees counter clockwise. To avoid disappointment, we kindly ask that you rotate one of the two files so that both files (front and back) share the same orientation. Please note: with diamond shaped artwork, you must indicate which is the top and bottom of the design. Square artwork without proper orientation labelling will not advance to the production stage until you can confirm it. 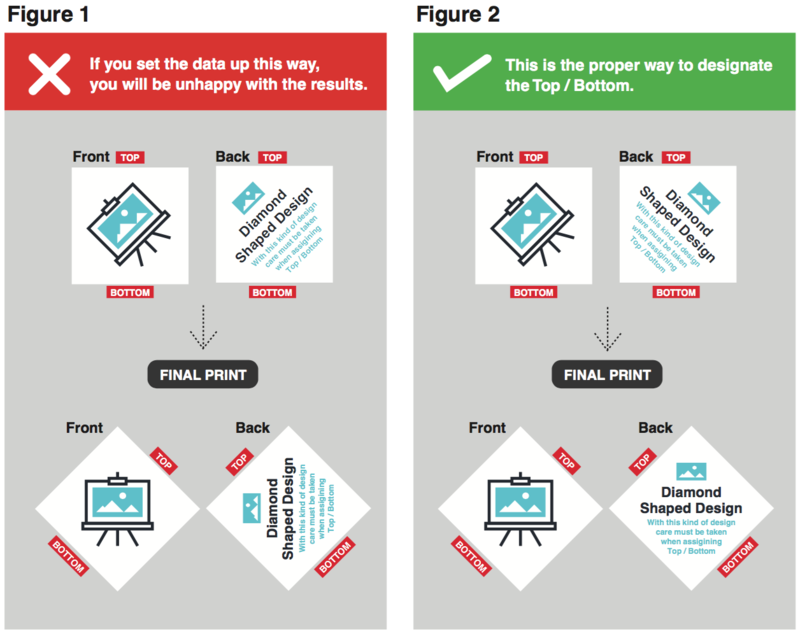 As shown in Figure 1, if you specify top and bottom when the direction of the design are both facing the same way, the front and back sides will not match when printing. Figure 2 shows the correct way to set the design up, and the correct way to assign the top and bottom designation.